Bajo and Phodi are an inevitable part of a festival lunch menu in our households.Baje/bajo are made using vegetables dipped in a spicy batter made with chickpea flour,red chilly powder,hing and salt and then deep fried.Generally vegetables like cauliflower,capsicum,potatoes,sweet potato,raw banana and the likes are used while phodis are generally smeared with red chilly powder and salt and shallow fried on a tawa. I have always made only similar kinds of fries with cauliflower,so when I saw a different recipe for the same on Prabha's blog,I was intrigued.More so,the name sounded so interesting.Varuval's are mostly non-vegetarian,at least those that I have come across.So decided to try this one out. Mix together the ingredients listed under marinade,it should be of thick consistency.Mix in the cauliflower florets and toss well. Refrigerate for 30 minutes-1 hour. Heat oil in a kadai for deep frying and drop the cauliflower florets about 4-5 at a time.Cook until the florets turn brown and crispy. Drain to an absorbent paper towel. 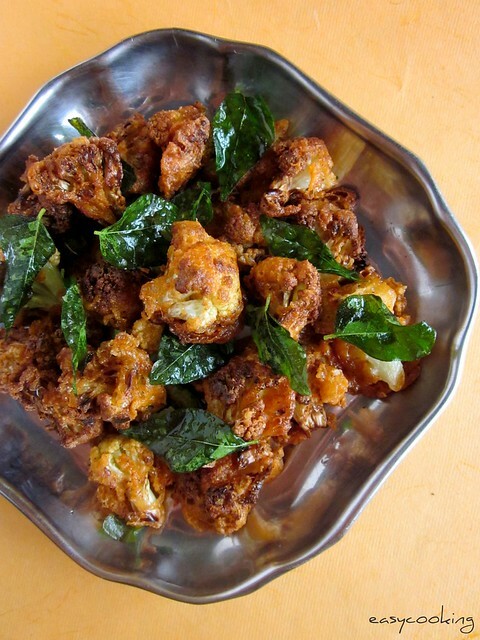 Garnish with fried curry leaves. Make sure the batter is not watery.Add water while mixing only if necessary,if the batter is thin the cauliflower will become oily after deep frying. Add only 4-5 florets at a time,crowding the florets will cause it to stick and not cook well. 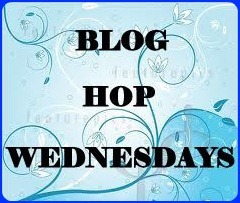 Blog-hop Wednesdays is an event started by Radhika,wherein we are assigned a blog every alternate Wednesday and we are supposed to cook from that blog and blog about it.What a great way to get to know each others blogs and bring variety to the dining table! I'm simply drooling. My hand just itches to grab one floret and pop right into my mouth. Well made. Crispy fritters looks prefect to enjoy for snacks with a cup of tea.. I love the tangy taste in this,nice recipe,yummy it looks! Cauliflower fritters looks so yumm. Crisp and loved the colour. using Curd in a batter to deep fry is truly new to me.. tempting pix ! marinated florets varuval has my attention- looks yum ! super yummy and mouth watering. delicious fritters... Goes well with tea.. It's tea time here and I'm craving for your fritters! Amazing dish dear. Never tried this version of fritters. They look amazingly delicious. Great appetizer, it will be a fab crowd pleaser too. 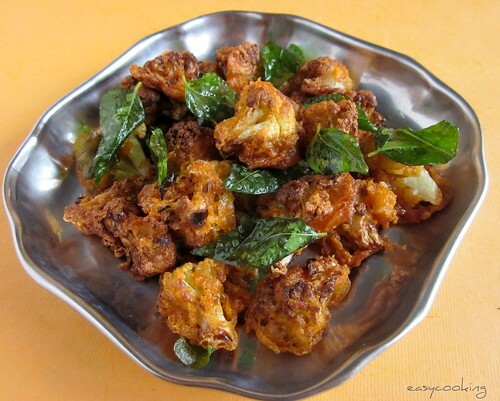 Nice color on the cauliflower divya. I tried making this yesterday and it turned out very tasty. I added rice flour and little besan instead of corn flour, since i ran out of it.A very different fritter indeed. Thanks for the recipe Divya. I like your blog. I just garnished it with fried onion and curry leaves.